After a stunning race at the TT Assen Circuit yesterday, where Valentino Rossi won his third race this season, the 111th in his career, starting from pole position, today the Movistar Yamaha MotoGP rider made his first ever appearance at the prestigious Goodwood Festival of Speed, which carried a theme of nostalgia and pride in the growing interest in motorsport, as Yamaha Motor Co., Ltd. took the occasion to celebrate its 60th anniversary. The nine-time World Champion was specially invited by Lord March to make his debut at this famous event as a guest star. Rossi traveled straight from the Dutch GP to the UK to be able to attend the event, where he was accompanied by Yamaha Motor Co., Ltd Executive Vice President, Takaaki Kimura, Yamaha Motor Europe N.V President, Kazuhiro Kuwata, YMC Motorsports Division’s General Manager, Kouichi Tsuji and Yamaha Motor Racing Managing Director, Lin Jarvis. They had the pleasure of joining a star studded guest list including numerous famous sportsmen, celebrities and VIPs, for a gala dinner and ball on the Saturday evening at Lord March’s grand estate, before the action started the morning after. Sunday kicked off with Rossi, Lord March, Kimura-san, Kuwata-san, Tsuji-san and Jarvis revealing the Doctor’s Yamaha YZR-M1, equipped with a special livery, in Yamaha’s display area in the F1 Paddock. 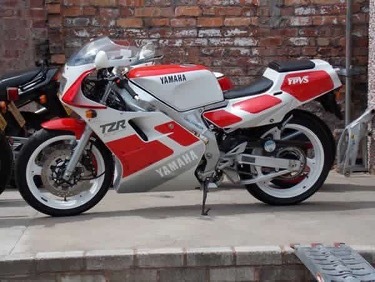 The yellow and retro styled bike commemorates Yamaha Motor’s 60th anniversary and the ceremony was completed by motorsport legends Kenny Roberts, Giacomo Agostini and Phil Read taking part in this celebration of Yamaha’s supreme racing heritage. Rossi’s yellow bike was in good company at the Yamaha exhibition; other iconic show bikes on display were Phil Read’s 1965 RD56, Giacomo Agostini’s 1975 YZR500 OW23 and Kenny Roberts’s 1978 YZR750 OW31. The unveiling of Rossi’s bike was followed by the Doctor delighting thousands of spectators when he rode up and down the 1.16-mile Hillclimb in the yellow livery at 11:40 am. 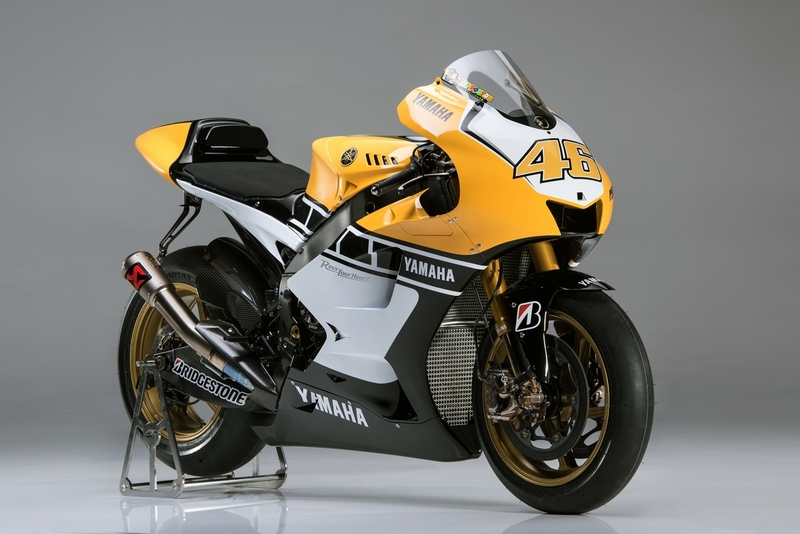 The special colour scheme of his YZR-M1 was similar to the one he and Colin Edwards sported ten years ago when they marked Yamaha’s 50th anniversary at the Raceway Laguna Seca with a double podium. After the thrilling ride, involving a 300ft rise, there was more excitement waiting. Rossi was interviewed by Goodwood TV on the balcony of Lord March’s mansion before joining the host and Formula 1 rider Nico Rosberg for lunch. The Italian concluded his first Goodwood experience by honouring this year’s theme of the Goodwoord event, ‘Flat-Out and Fearless: Racing on the Edge’. He fully enjoyed riding in a historical Le Mans-winner as well as a rally car, before heading home to prepare himself for the Grand Prix in Germany, to be held in two weeks’ time. It’s been an incredible weekend. I was barely off the podium before immediately heading to the United Kingdom, but I’m very happy that I got to attend the Festival of Speed at Goodwood, it has been a real pleasure! I knew about the event because I saw videos of it, but I had never been there before and it’s even more impressive than I imagined. It is a very large venue and there were many fans but also lots of famous riders, drivers and other VIPs which gave it a great atmosphere, especially when I rode my Yamaha YZR-M1 up and down the hill. I revealed my bike’s special Yamaha Motor 60th anniversary livery earlier this morning together with Giacomo and Kenny. For Yamaha Motor to be a part of motorsport history for so long and to have achieved so many accomplishments is very special and something to be proud of. At the end of the day I also got to drive a historic Le Mans car and also a rally car, which was great fun as well. I want to say a big thank you to Lord March for inviting and hosting me at this year’s event. I had a great time and made memories I will never forget! We now get to celebrate Yamaha’s 60th year, after celebrating Yamaha Motor Co., Ltd.’s 50th anniversary at Laguna Seca ten years ago. Over these years we have always strived to bring every Yamaha rider – professional or recreational – the feeling of ‘Kando’; a Japanese word for the simultaneous feelings of deep satisfaction and intense excitement that we experience when we encounter something of exceptional value. This year we experienced something truly special; to see Yamaha participate in this year’s edition of the ‘Festival of Speed’ at Goodwood and being able to share our 60th anniversary celebrations with thousands of fans is a unique experience. Their enthusiasm for our work and sport is one of the driving forces behind our companies racing efforts. The special livery reflects Yamaha racing’s DNA and its successful history. Seeing the spectators cheer as Valentino rode on a yellow Yamaha YZR-M1 MotoGP bike once again was a magical moment, and I’m sure it has left a lasting impression on everyone. It’s been really an enormous pleasure for us to be here and a wonderful new experience for all of us, attending the Goodwood Festival of Speed for the first time. We have come here straight from a highly successful race in Assen, to this incredible atmosphere, which is one of the most famous motoring and motorsports events in the world. For us it’s the first time together with Valentino and to be able to celebrate our 60th anniversary here together with our top management from Yamaha Japan and Yamaha Europe has been something very special. To see this amazing yellow, black and white color scheme again has brought back many emotions: racing has been such a rich part of our company’s history. It has been 60 years since the company began racing in 1955 and I think the crowd had a wonderful opportunity today to see Valentino relaxed, entertaining and in true Yamaha colors. In recent years the reason why we have been unable to attend is because the Assen event traditionally clashes with the Festival of Speed, but on this occasion Lord March made special arrangements to facilitate our coming to this event so it was a true pleasure and memorable experience to be here. A great thanks to Lord March and the organisation of Goodwood for inviting us, for hosting us today and for giving such a great experience to be here with the very best of the motoring and motorcycle world.